Sailing polarised sunglasses are plenty, with different shapes and colours to choose from. But if you need sailing prescription sunglasses correction you have one or two ‘special’ frames to choose from Right? At extreme-eyewear.co.uk we’re very happy to tell you this isn’t the case. You can choose from over 95% of the sunglasses listed on our site. You can have your prescription directly glazed (fitted) into your own choice of running prescription sunglasses. We have every type of lens available including transitions, Polarised Vario NXT (Sports specific reaction lenses that have a base tint instead of the classic transitions clear to dark), and polarised prescription lenses. Of cause we also supply more standard colours as well such as brown, grey, orange, and clear for night / winter. All the lenses we supply have 100% UV protection, are classified sports protection lenses / impact resistant and come with hard coats. You also have the options of Anti-reflection, and mirror coatings. 1) Polarised Transitions – this is a brand of reaction lenses. They react from light grey to either dark grey or brown. Available with Anti-reflection or a mirror coating. Transitions are the fastest and best lenses on the market and available from Oakley True Digital or our own Xtreme lenses. These lenses are ideal if you commute or sail at dusk or night time. 2) NXT Vario lenses – these are sports specific lenses supplied with a base tint which stays constant, they then have an additional layer which reacts to the sun light. Ideal if you only use your sailing prescription sunglasses on in the day time. You can choice orange, copper or yellow base tints which will lift your vision in low light. 1) Choose rose, brown or orange base tints which will lift your contrast and depth perception in low light. A good trick is to choose a sailing prescription sunglasses that has a mirror coating in front of one of these tints, this way the mirror will reflect away dazzling sunlight when brighter but still have a good contrast lifting tint for lower light conditions. Oakley Flak Jacket XLJ Prescription sunglasses offer excellent anti-fog properties with wrap around style. 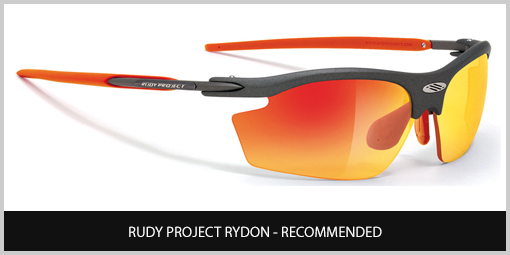 Rudy Project rydon Prescription sunglasses offer full adjustability on their nose pads and ear tips. Bolle Tempest prescription sunglasses deliver extremely thin prescription lenses for high prescriptions.